双语阅读：惊呆了 迷你猪长成了庞然大物 - 英语口语 - 金桥翻译论坛 - Powered by Discuz! A couple who thought they had a fashionable micropig were stunned when their prized pet grew into 47 stone MONSTER. The gigantic grunter, called Esther, is heavier than a fully grown polar bear - but owners Steve Jenkins and Derek Walter thought she would stay a cute little piggy, never weighing more than five stone. The whopping swine, thought to be a commercial hog, lives in their house, eats ￡30 worth of fruit, veg and oats a week and even enjoys a nap on the couple’s bed. And the two-year-old sow is an internet sensation with her own Facebook page, Esther the Wonder Pig, which has an amazing 235,000 followers. Steve, from Ontario, Canada, said: "We lived in denial for a long-time, friends would come over and say 'she's getting bigger' and Derek and I would say 'no she's not'. "But soon she was standing to steal things off the kitchen counters, the couch became smaller, and of course there was the weight gain. "We just adapted and loved her more. What else could we do? It wasn't her fault and we would never give up a pet. "At night, when we lived in Georgetown [America] she had a mattress in the living room, but since we moved to the farm she has decided she needs to be close to us and now sleeps beside our bed with her mattress on the floor. "She still on occasion climbs up onto our bed for a nap during the day." The enormous animal - who is toilet trained - lives in their house along with two dogs and a cat. The couple provide daily Facebook updates on Esther's exploits and sell calendars, postcards and mugs featuring the gentle giant. Esther is now almost ten times her expected size, and is fed a diet of rolled oats, barley, and corn. She also enjoys fresh fruit and vegetables like over ripe bananas and veggie peels. The cute pink animal spends her days rooting in the gardens, eating, sleeping and cuddling up to her other furry friends. 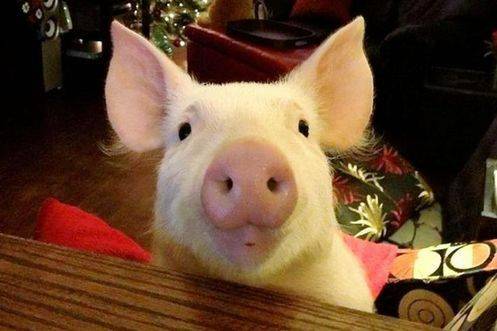 In just one year, her Facebook page has picked up more than 235,000 followers who are treated to pictures and videos of the pig. Steve added: "It is still surreal and absolutely mind-boggling. We started Esther's page just as a way for immediate friends and family to stay in touch with us and Esther's antics. "But one of those friends shared Esther's page on an animal-related website and the next thing we knew Esther's page had 10,000 likes and it never stopped. "Derek and I are Esther's voice and some days it is really challenging to come up with new quips and I will sit there staring at a picture until something comes to me. "Other days it's as if I can read Esther's thoughts and I swear she can convey them with her eyes and her smile. "People's reaction to meeting Esther still amazes us, it's like they're meeting a movie star or royalty. Even now people are amazed by her size and her awareness. "It is as if she knows she is famous and that is her role, that she is changing the world's view of her kind and their amazing abilities to think, feel and be loved." GMT+8, 2019-4-23 09:51 AM , Processed in 0.034168 second(s), 13 queries .